Belvedere has been providing the highest quality products & services to the salon industry for over eighty-five years. Belvedere has committed to ensure salon customers are experience comfort with all of their products. Whiz spray. Single screw-on connector 42" black. The Belvedere HT1 Hair Catcher Trap is designed for beauty salons and barber shops for easy cleaning and removal of hair in the drain. Never get a clogged sink again with this unique trap. Standard model complete with hose receiver and hose. ASSE 1001 approved. Standard mode vacuum breaker. Does not include hose receiver or hose. ASSE 1001 approved. Belvedere 5001835 - Black Gel Neck for use with shampoo bowls. This gel neck provides comfort while the customer is having their hair washed. Belvedere 522A - Single lever shampoo control valve faucet, hose sold separately. Black rubber neck rest for use with Omega(2100), Beta(2800), Cameo(3100), and Alpha(3800) bowls. Deck mount fixture with spout. Chrome single handle contrl diverter. Thermostatic tempering value. Factory set at 105 degrees. ASSE 1016 approved CSA B125 approved. Replaces 0039 Flow-Trol. Service Parts: Vacuum breaker hose reciever bagged assembly. Service Parts: 403 Vacuum breaker repair kit bagged assembly. Service Parts: 3" Hair strainer bagged assembly. 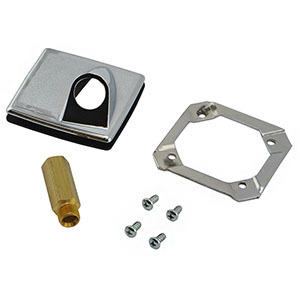 Service Parts: 403 and 403L mounting hardware bagged assembly. Service Parts: Plain hose receiver bagged assembly. Service Parts: Hose receiver gasket bagged assembly. Service Parts: 622T-228 tail piece bagged assembly.